A QUT-led study of Queensland motorists and cyclists recommends that efforts to improve cyclist safety during overtaking events should focus on improving roadway infrastructure. Professor Haworth, director of QUT's Centre for Accident Research and Road Safety – Queensland (CARRS-Q), said other studies have revealed many bicycle-and motor vehicle crashes occurred while both were travelling in the same direction and involved rear-end and sideswipe collisions. This study has concluded lane widths and speed limits influence the distance drivers leave when passing, not cyclist characteristics. Funded by the Queensland Department of Transport and Main Roads, the study reviewed 2000 overtaking events at sites in Brisbane, Rockhampton and the Gold and Sunshine Coasts. The overall rate of non-compliance with the minimum passing distance rule was around 16 per cent. "In Australia, sideswipe collisions between cyclists and motorists account for 14% of fatal bicycle crashes and passing too closely is the most common incident type, but it is too simplistic to blame motorists for poor driving," said Professor Haworth, lead author of Factors influencing noncompliance with bicycle passing distance laws which has just been published in international journal Accident Analysis and Prevention. "Australia, like many other countries, has implemented laws to require a minimum distance when motor vehicles pass cyclists, but research into the factors influencing passing distances has produced inconsistent results. "Our study examined the factors influencing motorists' compliance with the law in Queensland and was done in such a way that none of the motorists or the cyclists were aware of being studied. "As a result, this study captured the 'true' driving and riding behaviours during passing events. 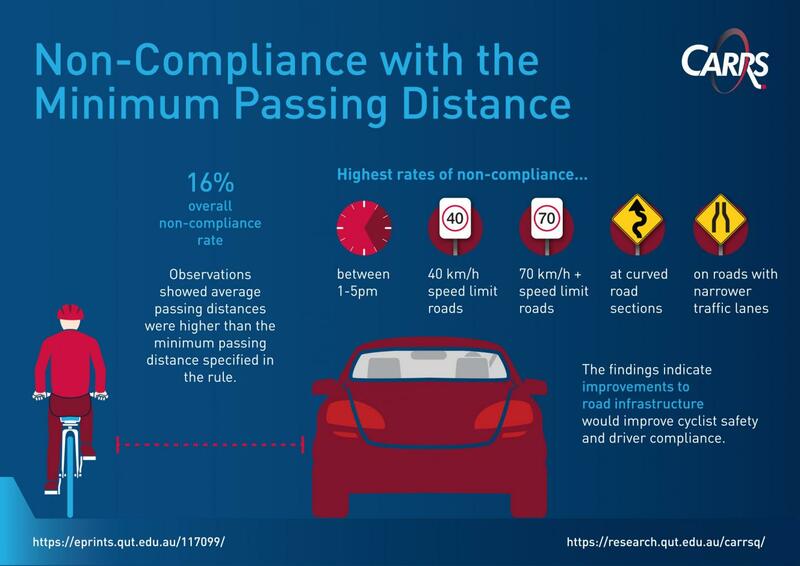 We found the likelihood of non-compliance was greater outside of peak hour as well as on higher (70-80 km/h speed limits) and lower (40 km/h) speed roads than 60 km/h roads, at curved road sections, and on roads with narrower traffic lanes. "Rider characteristics (age, gender, helmet status, clothing, type of bicycle, and individual vs group riding) had no statistically significant association with driver compliance." Professor Haworth said the Queensland Government implemented a minimum passing distance rule in 2016 after a two-year trial. CARRS-Q has been conducting evaluations of it with the assistance of Bicycle Queensland and the RACQ. "For this particular study we captured video of cyclists and motorists involved in passing at a range of locations, including urban, suburban, regional areas and tourism hot spots," Professor Haworth said. "The results showed compliance levels are influenced by the characteristics of motorists and the roadway, but not of the rider. The key finding is that cycling would be a whole lot safer for riders if road infrastructure was improved. This might mean more cycling lanes, for example, while stronger enforcement of the law by authorities would also help to further increase driver compliance." The study can be viewed online at QUT ePrints.